In almost every liberal democratic society, an issue that is a topic of constant and passionate public discussion is how much that country’s ministers, legislators, senior civil servants, and senior judges should be paid. Nor is this surprising; the issue has considerable voyeuristic appeal, particular democratic significance, and important ramifications for the functioning of the public sector as a whole. However, like most political debates, these discussions tend to be messy, fragmented, and full of unverified assertions and spurious appeals to populist sentiment. It is hardly surprising that those discussions rarely succeed in putting the matter to rest. Paying Our High Public Officials examines the political discourse concerning this question in 17 liberal democracies (Canada, the United States, Mexico, Norway, Finland, the Netherlands, the United Kingdom, Ireland, Germany, Austria, Switzerland, France, Poland, Italy, Hong Kong, Singapore, and New Zealand). Based on many hundreds of parliamentary debates, newspaper articles, speeches, as well as reports by think tanks and high commissions of state, the book identifies seven central arguments that occur in all these societies, translates them into the language of analytical philosophy, and then rigorously evaluates them. This approach contributes to a better understanding of this controversy and may result in better-justified and more legitimate conclusions concerning which policy to adopt. 1: The Problem of High Public Officials’ Remuneration. 2: Analytical Discourse Evaluation: A Manifesto. 3: The It’s Taxpayers’ Money Argument. 4: The Compensating Benefits and Broad Comparability Argument. 5: The Motivation Selection Argument. 6: The Live Like Common People Argument. 7: The Example Argument. 8: The Optimal Performance Argument. 9: The Corruption Argument. 10. Conclusion: Three Questions, Two Visions. Teun J. Dekker is currently Assistant Professor of Political Philosophy and Vice-Dean of Academic Affairs at University College Maastricht – Maastricht University. He has held visiting research positions at Amherst College and Yale University. He has had articles published in Inquiry, Ethics and Economics, The Journal of Value Inquiry, The Canadian Philosophical Review, Imprints, and Politics, Philosophy and Economics. "Teun Dekker applies a fresh intellectual lens to a vitally important and grievously muddled public issue." "It is difficult to escape discussions in the media about the salaries and perquisites of public officials. 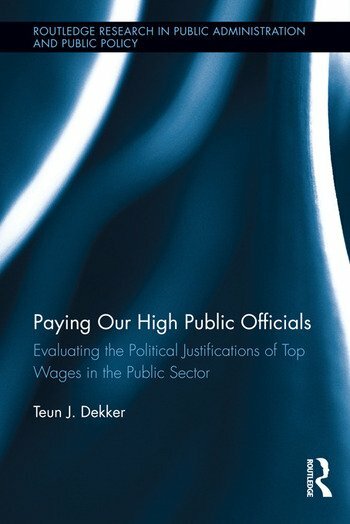 Most of those discussions have more heat than light, but Teun Dekker has provided a lucid analysis of the justifications for those rewards for public office. He evaluates a range of justifications offered for pay and perquisites, and demonstrates their linkage to political theory. This is crucial reading for anyone interested in contemporary governance."